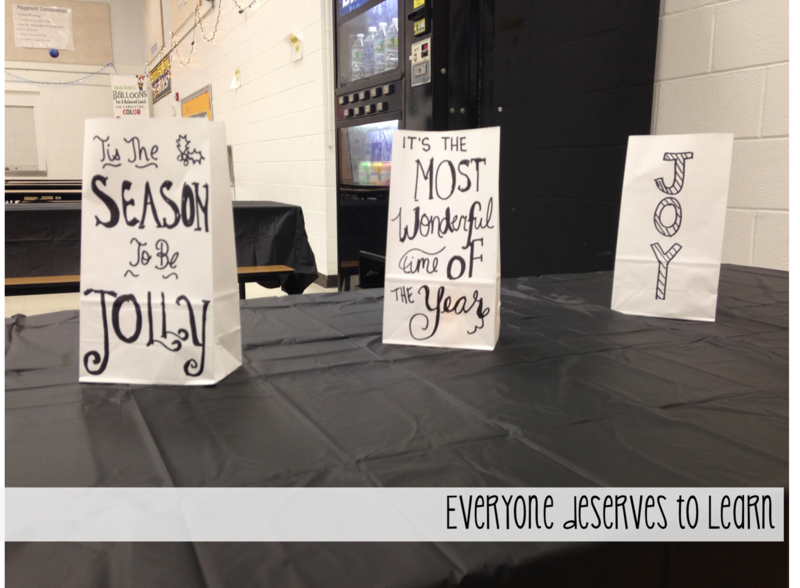 This week we held our 3rd annual ESL Christmas Party. Each year our party gets bigger and better...I'm not sure how we can top it next year! Here's a photo re-cap of the fun. We asked the students to make wishlists for something they want, something they need, and something to read. We compiled that information into a google drive spreadsheet and sent it to our faculty. 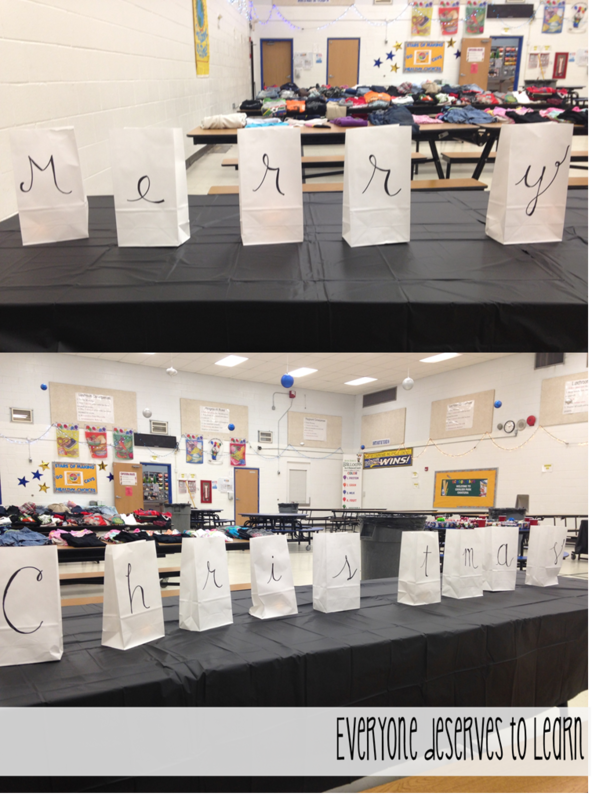 Teachers were able to put their names next to items/students they would donate to. 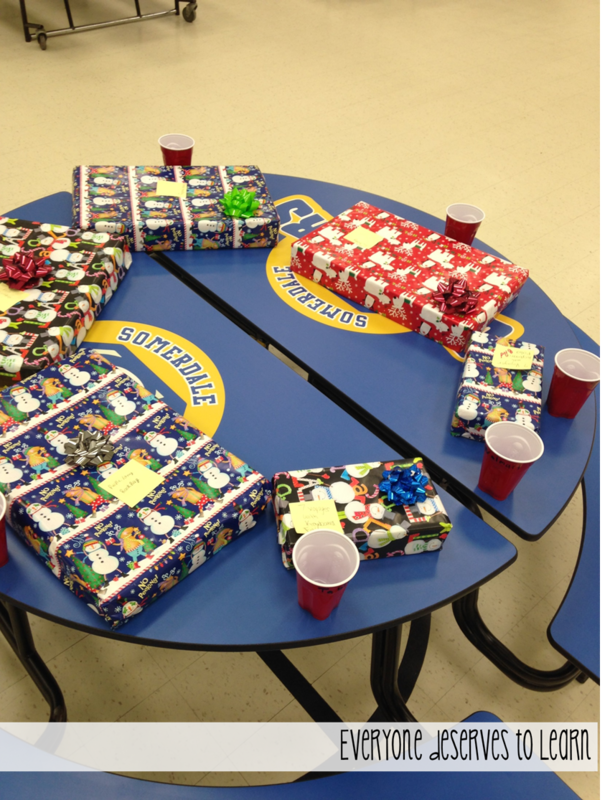 We also included some supplies we needed, like wrapping paper, tape, plates, and napkins. We sent the spreadsheet out the week before Thanksgiving, allowing plenty of time to shop. My teammate had the brilliant idea to pick up the red Target bags you see in the picture above- she bought 50, and we could have used 50 more! 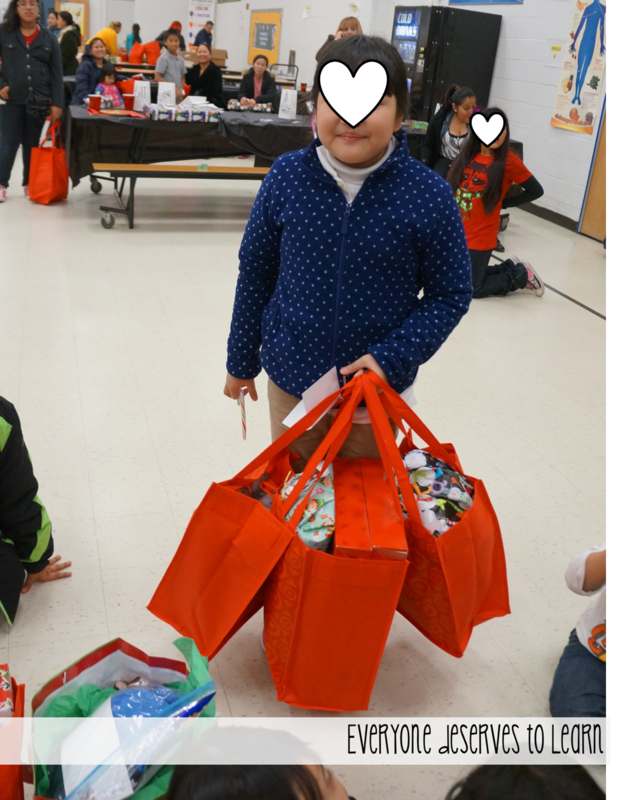 They were so perfect for holding all the presents, as well as canned food and clothes that were donated also. 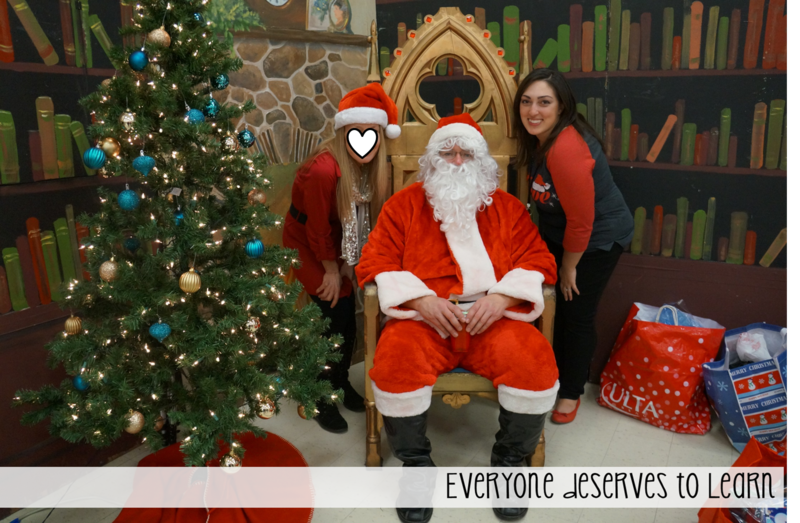 My teammie and I constantly get donations brought to our classrooms, so we allow the parents to "shop" twice a year. 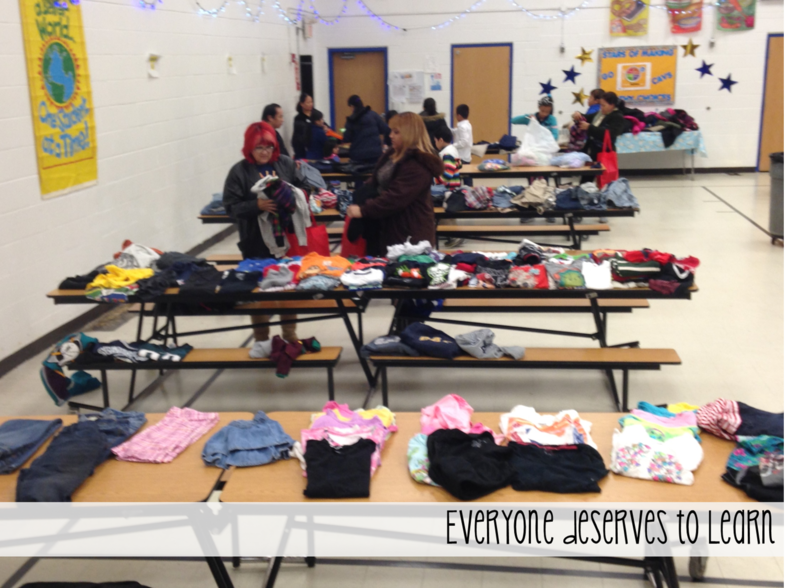 We had four long cafeteria tables filled with clothes. 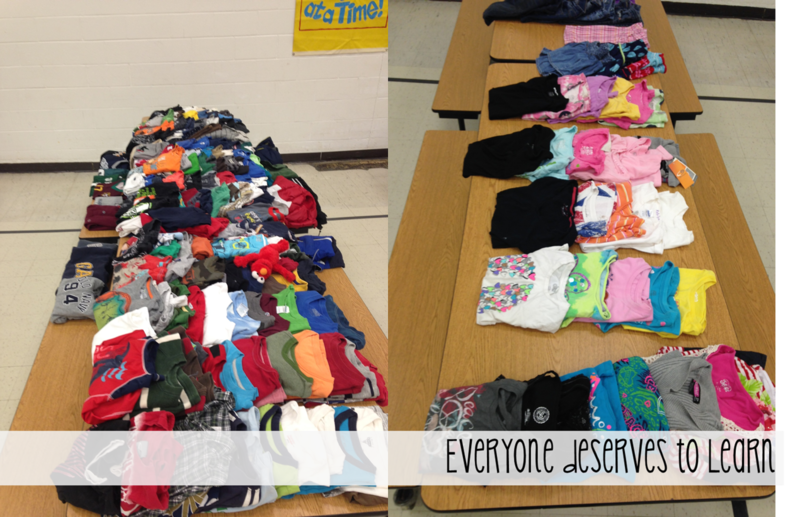 Our Student Council spent over an hour sorting, folding, and displaying each article of clothing. There were also 3 long cafeteria tables full of canned and non-perishable food that was donated by the Student Council around Thanksgiving. Those red bags really came in handy! 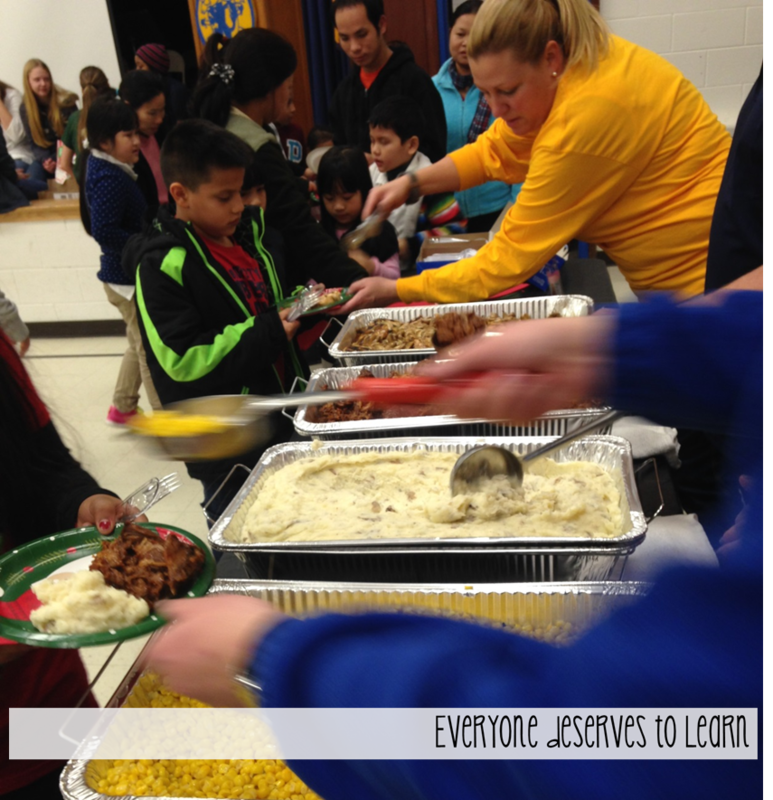 The food for the party was donated by a faculty member's husband who works at Texas Roadhouse. He also happened to help us out as the big man in red. The same family also donated for about 6 of the students. They're just amazing- proof that there are good people in the world. 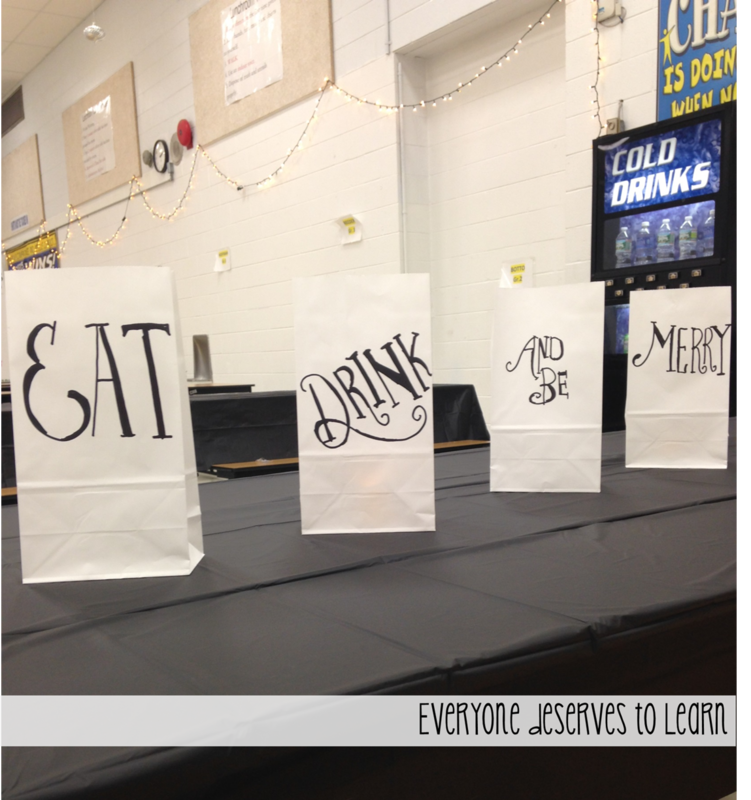 We wanted to dress up the cafeteria, so I picked up some white bags from Michael's and tossed in some battery-operated tea lights. Of course I had to make them pretty! 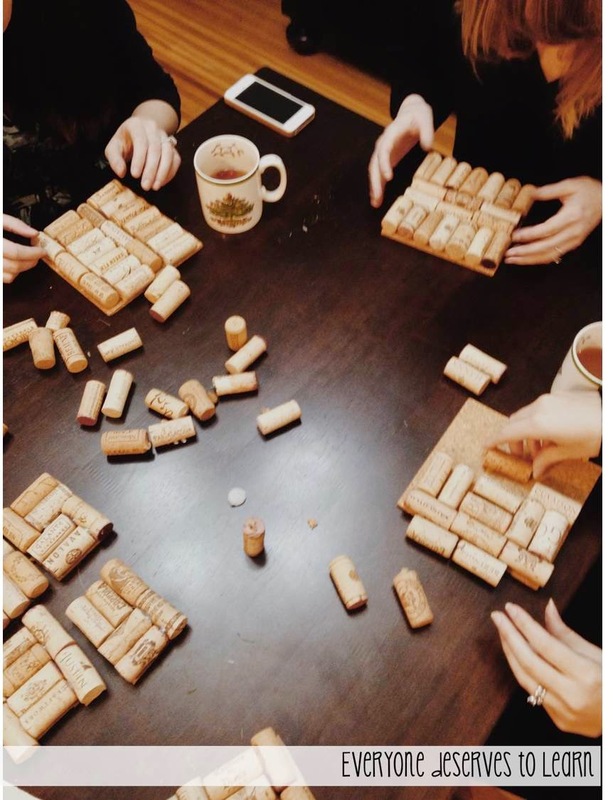 My teammate jokes about how I couldn't live without Pinterest...she's right! 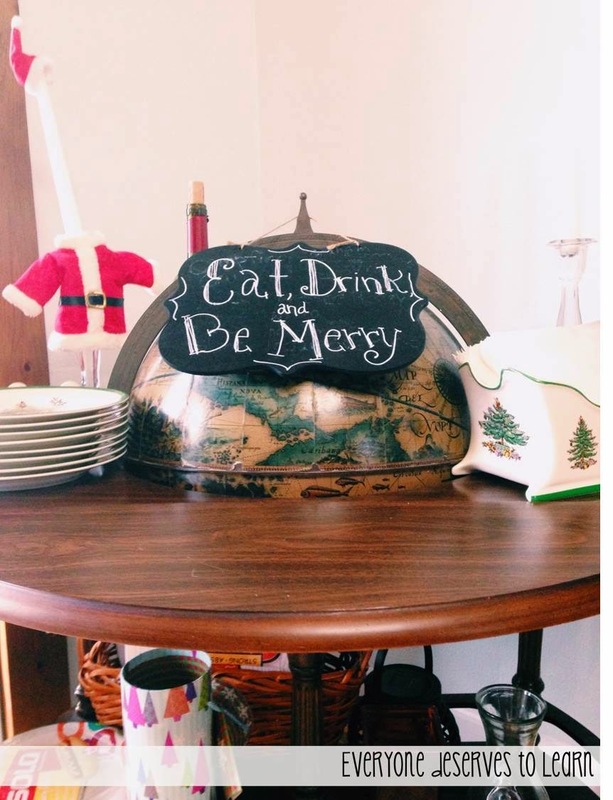 I searched "Christmas hand-lettering" and just copied the ones I liked the best. These were so easy and came out great- I'm keeping them for next year! Lucky for us, there was already a set and Santa chair left over from the chorus concert, and I put up our little tree next to it. We had a fabulous party. 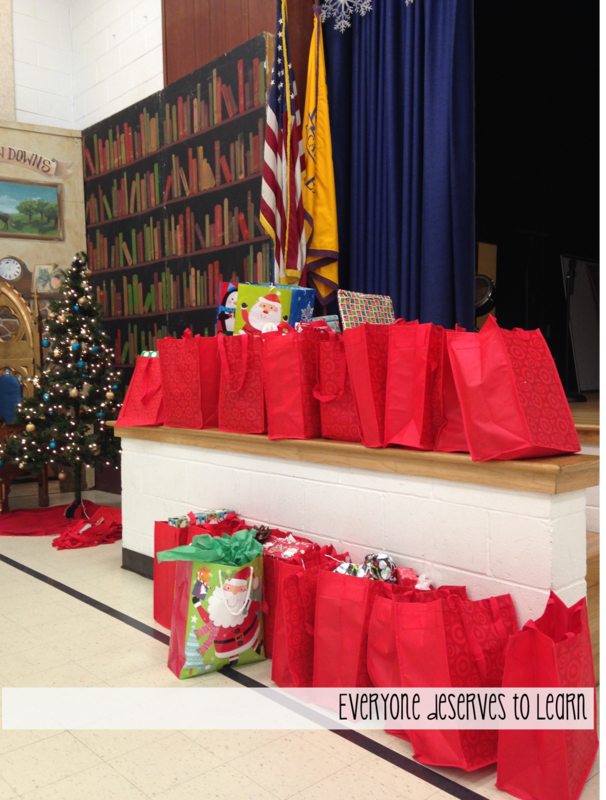 We couldn't have done it without the help of our faculty and family "elves." We are so grateful for all the help and donations we received. Now that the party is over, "It's time to get started on next Christmas!" (From Elf!) Just kidding. I need to sleep! I wish you and yours the merriest of Christmases and the happiest of New Years! Have you always wanted to make some of those crafts you've had pinned for 3 years on Pinterest? How about cook up some of those mouthwatering dishes from your favorite food bloggers? 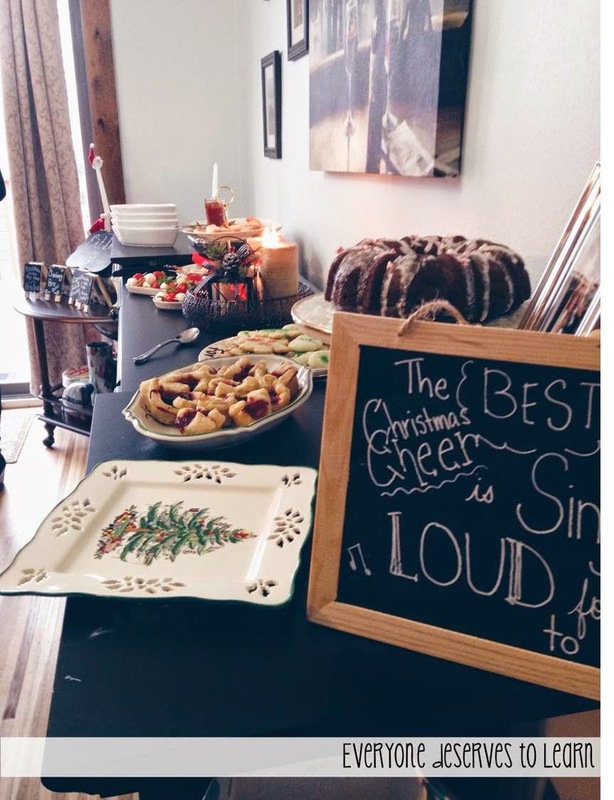 I decided to host a Pinterest Party for some of my girlfriends, and boy, did we have a blast! Come along and see how I put it together...get ready for picture overload! I invited my friends for a mid-afternoon party, knowing that it would take some time for paint/glue to dry. I planned a menu that was cocktail-inspired, including lots of heavy apps. 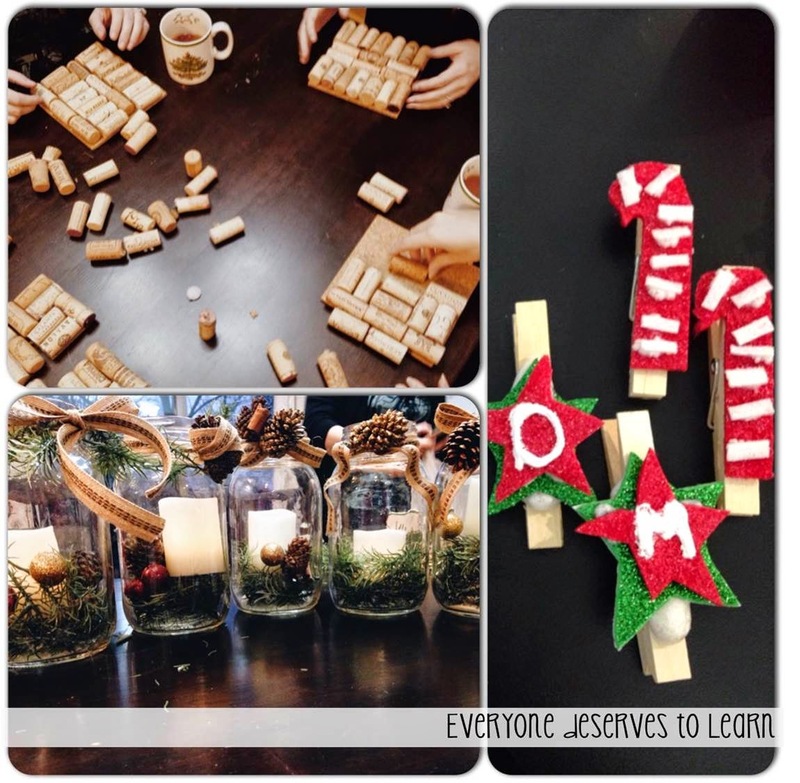 I created a Pinterest Party board on Pinterest- all the recipes and crafts we made are there. Click any picture to go to the board. 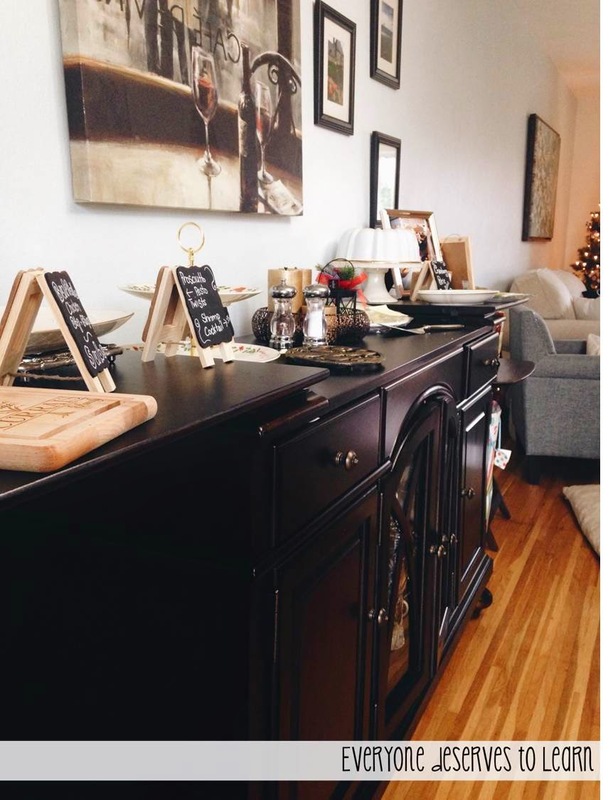 I set up all the food in our dining room; our buffet server opens up to accommodate more serving dishes. The globe is an antique bar cart that came from my parents' house. I always loved decorating it when I lived there, and am so glad it was passed down to me. I did some chalk art to dress up the space. 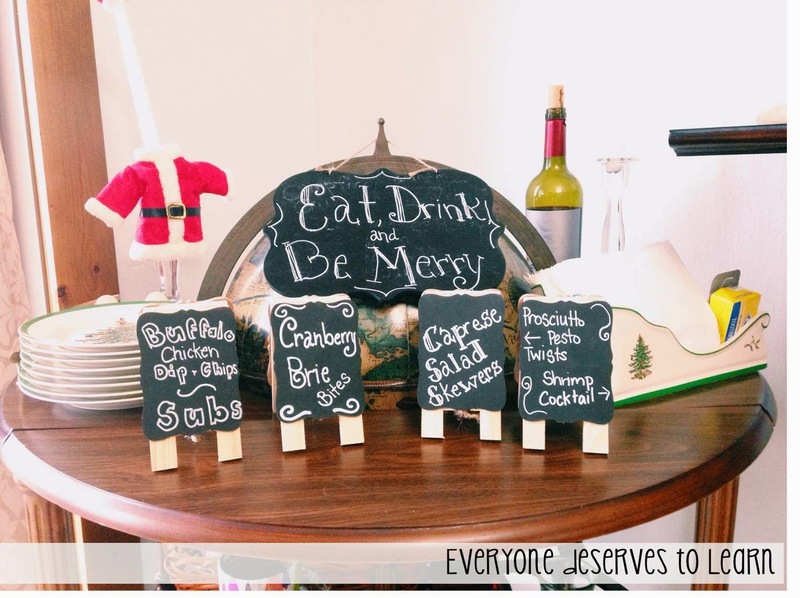 The small chalkboard easels came from Walmart, the others from Michael's. I am a sangria lover, and this was one of the best I've ever had. 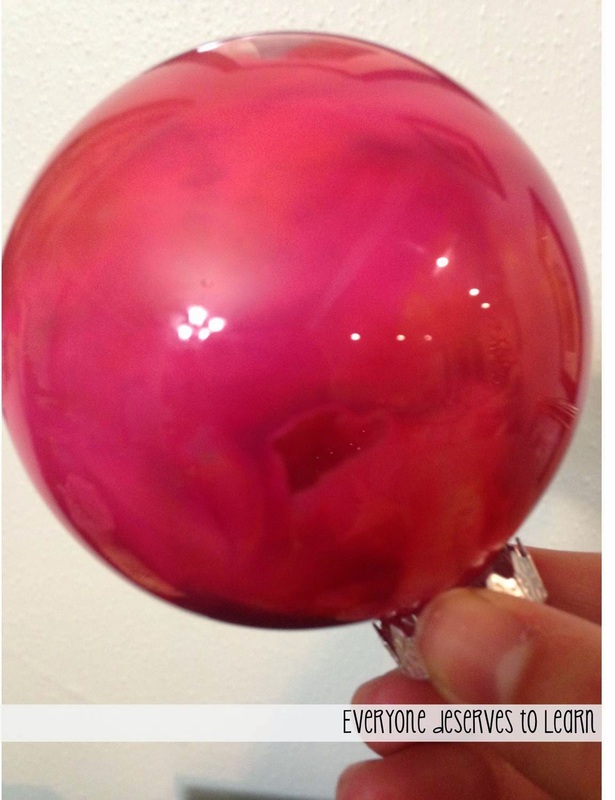 I combined two different reds since I didn't have time to run to the liquor store, and it came out great. 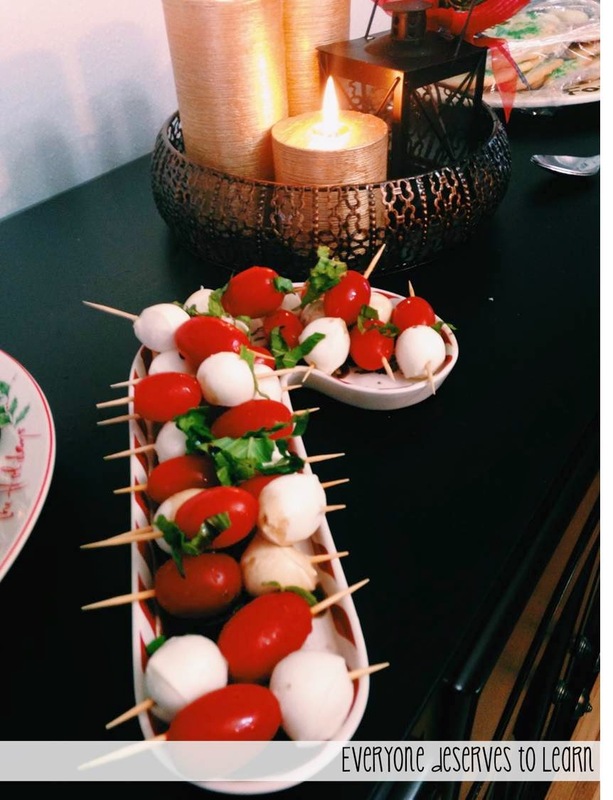 I made some caprese salad skewers and shrimp cocktail. 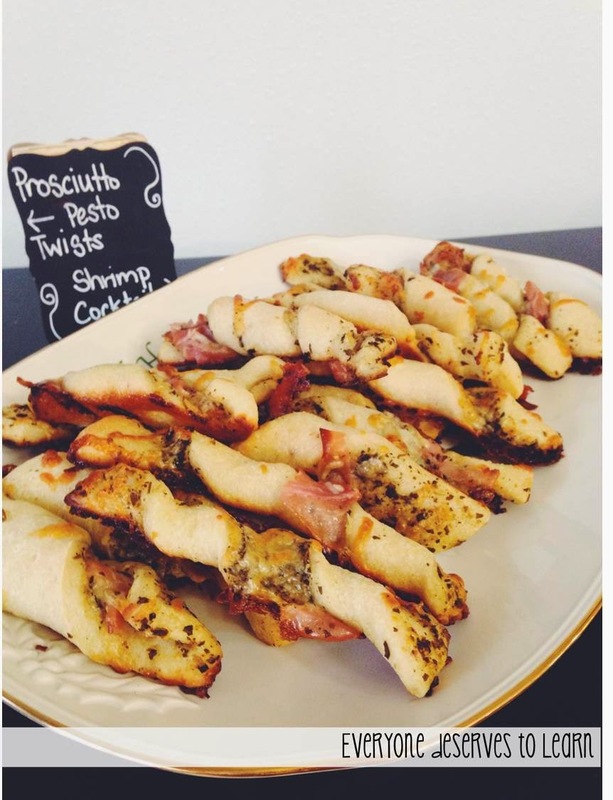 I tried to keep my menu based on finger foods that we could eat while crafting. I promise I'll get to the crafting part in a little bit! 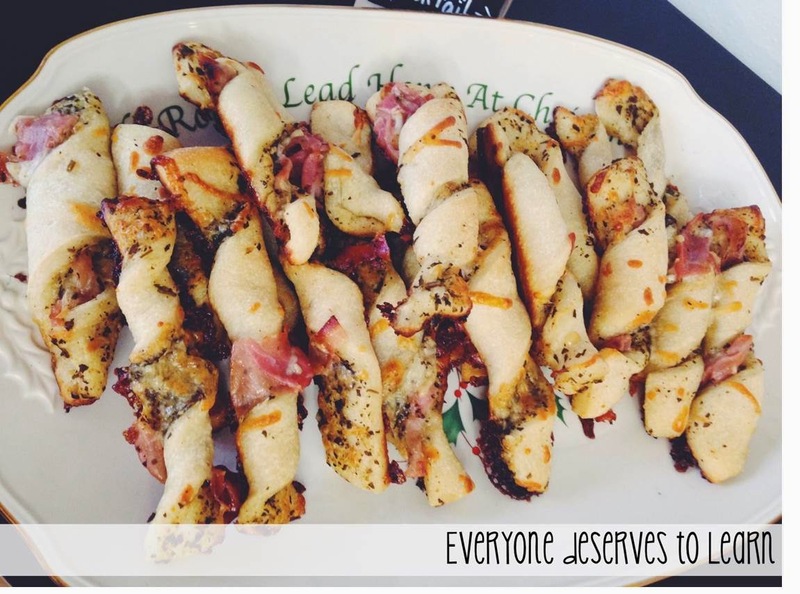 These prosciutto pesto pizza twists were a hit! I was able to make them the morning of the party and pop them in the oven right before my friends arrived. 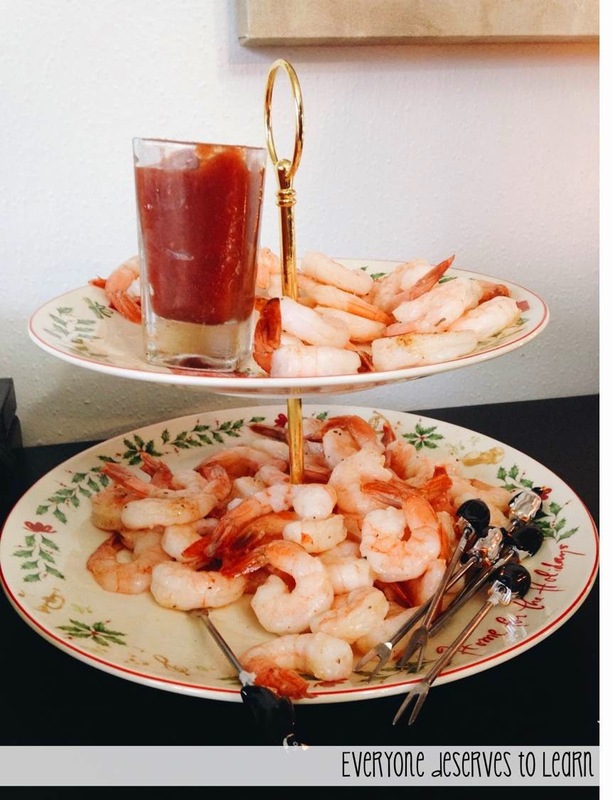 These are definitely going on my must-make list for future parties! 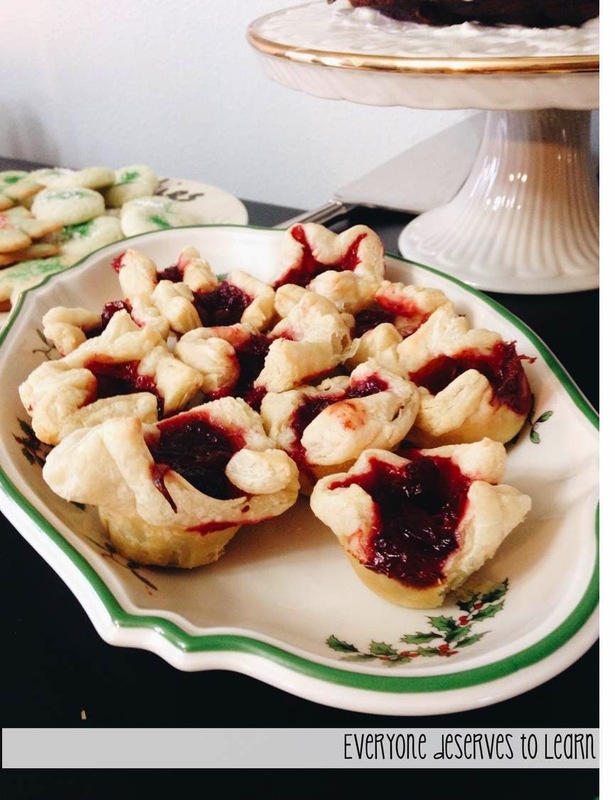 I made cranberry brie bites as a crossover between app and dessert- they had just the right amount of sweetness to balance the other savory apps. Not pictured are the subs and buffalo chicken dip- they were quickly commandeered by the husbands and taken downstairs where the football game was on. 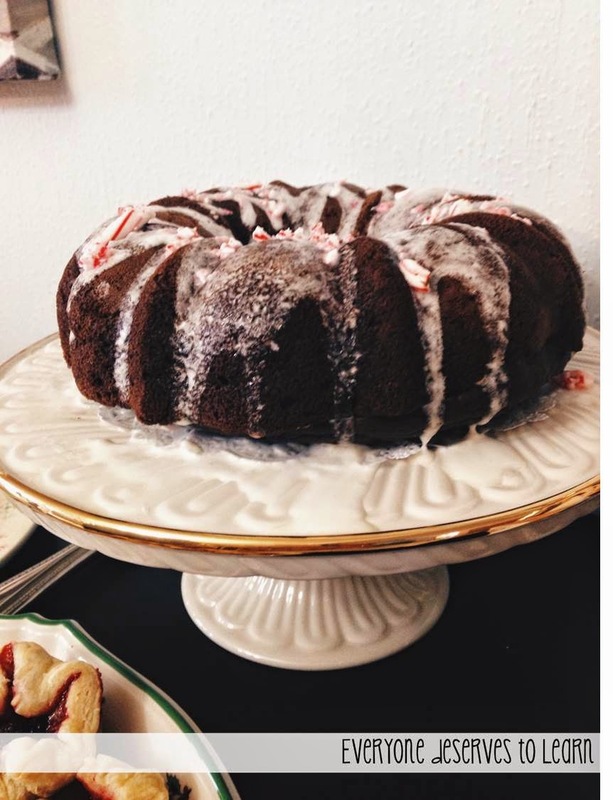 I made my favorite chocolate cake with a mint twist. I also made grinch cookies and cornmeal cut-out cookies. Once we had eaten our fill, we settled in for some crafting. I asked each attendee to bring enough supplies for everyone at the party to make one craft. We started with the craft that needed painting...but that one was a craft-astrophe and we didn't finish. It was fine, because we had 4 other crafts to work on. 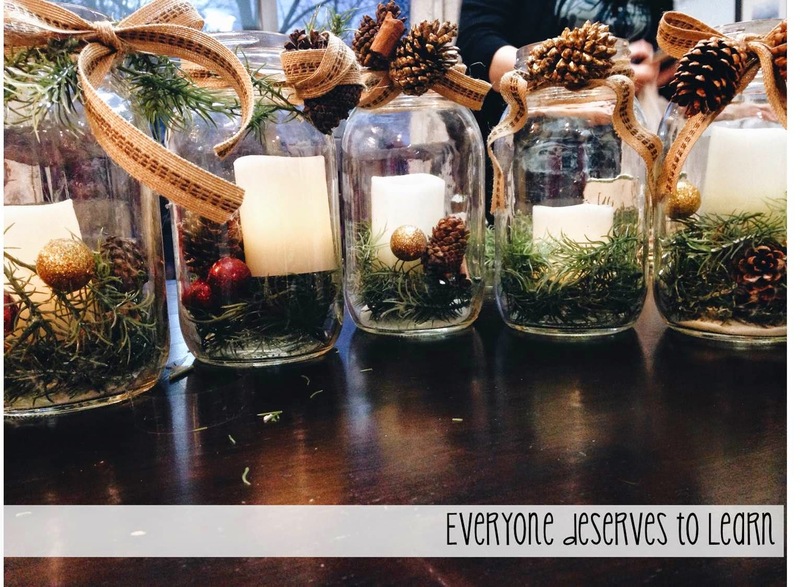 We made mason jar candle wreaths. And we made melted-crayon ornaments. 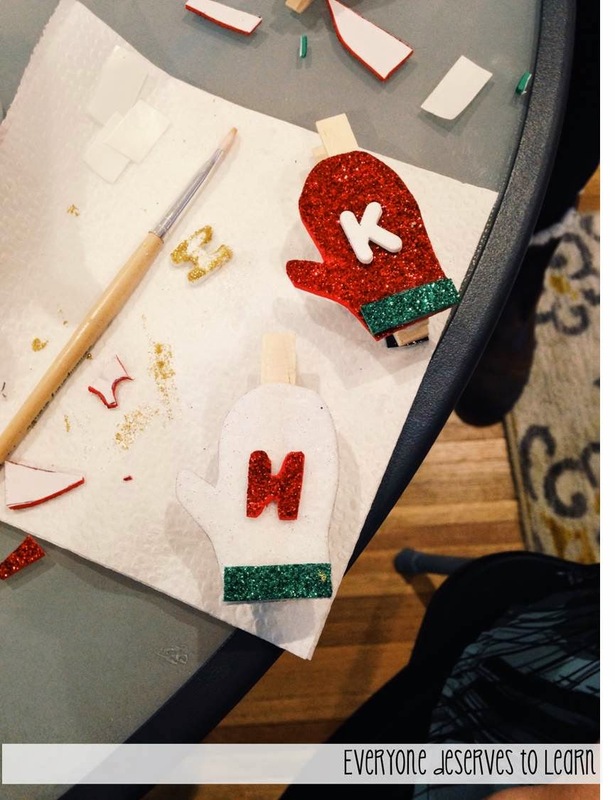 We laughed, we ate, we crafted, and we ate some more. It was a wonderful party and so easy to put together. I am planning to host another one for the summer- there are so many great 4th of July and outdoor crafts we can work on. 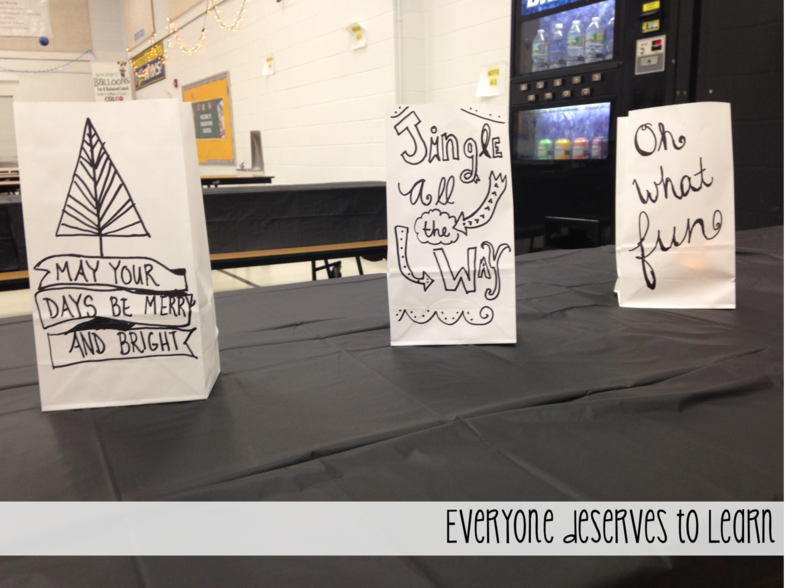 This is a great and inexpensive way to get your friends together, and everyone leaves with a goody bag full of crafts. A lot of my best ideas come at the last minute. I'm a chronic "seat of my pants" lesson planner- I write lesson plans but never follow them. Many times I'll see something better, more fun, more engaging, shiny (I may be part raccoon) on Pinterest or Instagram right before a class and drop everything to work on it. I'm the same way with cooking. There are some recipes I follow exactly, like baking cookies or a boeuf bourgignon. But for a weeknight dinner, it's not uncommon for me to take pieces of recipes, put them together, and throw salt over my shoulder for good luck. 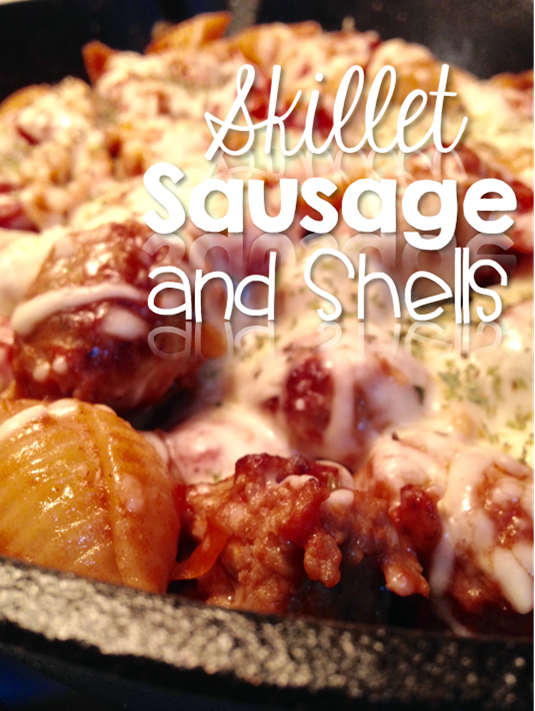 This time, I looked at a few of my staple sausage recipes but nothing interested me. 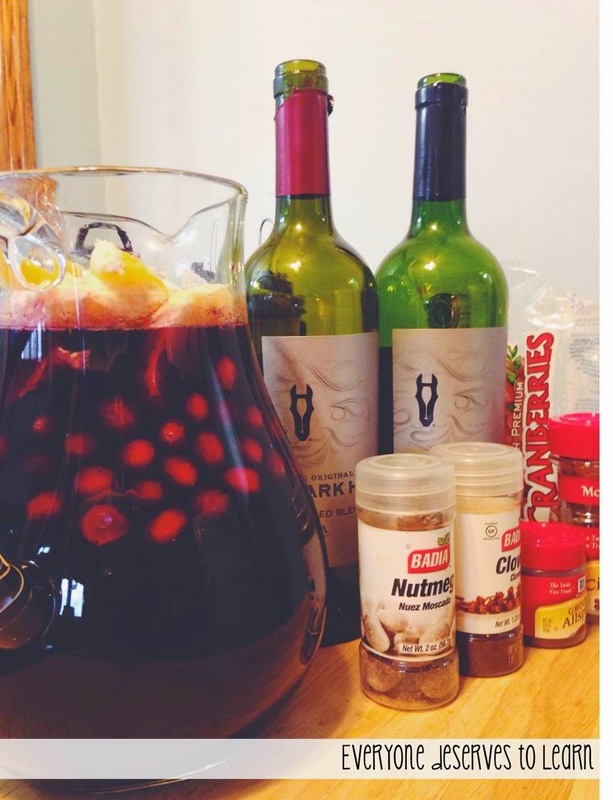 I shopped my pantry and created my own recipe based on what I had. This was a satisfying, hearty, and easy meal that came together in about 30 minutes. Heat the EVOO over medium high heat. Add the sausage and brown for about 3 minutes on each side. Add the chopped peppers and continue to cook for another 5 minutes. Deglaze the pan with 1 cup beef stock, allow to reduce by almost half. Add the diced tomatoes and pasta. Stir to coat the pasta with sauce, then add more stock if needed. (I used both cups of stock.) Bring sauce to a boil, then simmer at medium heat for 20 minutes, covered. Stir during the last 5 minutes to test for doneness. Add salt to taste. 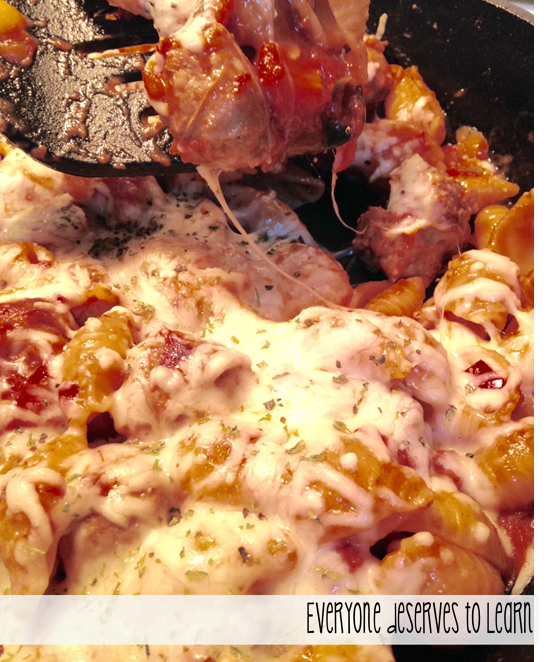 One pasta is tender, stir in Parmigiano Reggiano cheese and top with mozzarella. Allow mozzarella to melt, or pop under the broiler for a few minutes. Sprinkle on some basil and parsley (I only had dried, but fresh would be better) and serve immediately. You can change the seasonings as you'd like- add some red hot pepper for spice, or some Italian Seasoning for a more savory taste. All in all, this was simple, fast, and perfect for a chilly weeknight. Mangia! 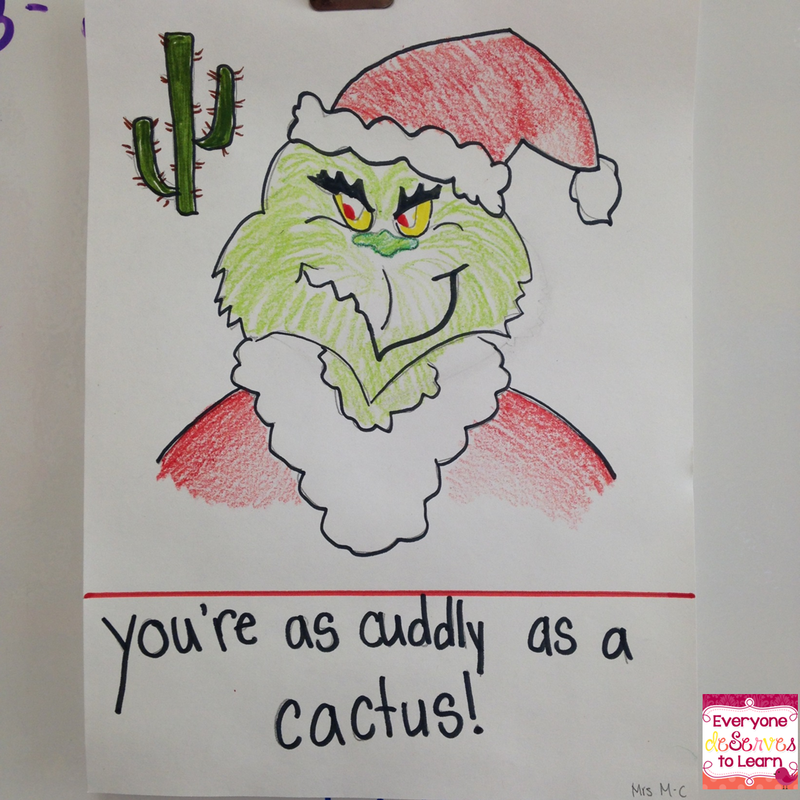 He's as cuddly as a cactus, he's as slimy as an eel, and for some reason my students adore him. I had started a figurative language unit after Thanksgiving and my students all had a pretty good grasp on similes. They were really struggling with metaphors. Really really struggling, and I was stumped on what to do. I brought in a stuffed Grinch to use for the 12 Days of Elf-mas, and as I was setting him on the windowsill, a lesson idea came to me. As with most days, I threw out the plan I had (what plan?) and hastily whipped up this one. 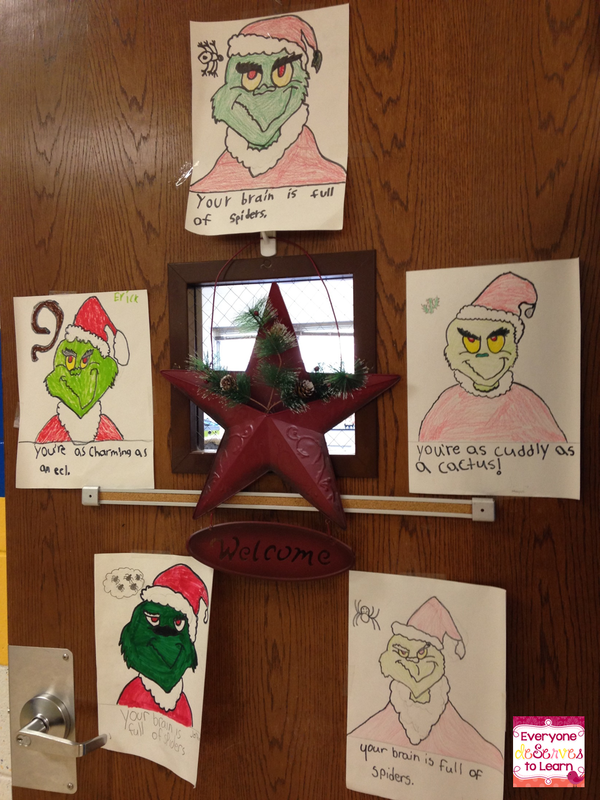 I began by holding up my stuffed Grinch and asking the students to tell me orally what they knew about him. Most had seen the cartoon or live action movies before, and could tell me some basic background. Some of my ELL's had seen him before, but couldn't tell me anything about him. I played the cartoon version of the song (you can find it on youtube) to let them become familiar with it. Then, I gave each student a copy of the lyrics (get them here: Fit to Be Fourth) and asked them to pay attention to the similes in the song. We discussed them and wrote them on an anchor chart. We had already discussed hyperbole when we studied Tall Tales, which helped out a lot with them understanding that some things are not literal. I have a group of majorly concrete thinkers. To review metaphor, I split them up into teams and played the song for a third time. While they were listening with the lyrics in front of them, I asked them to think about other comparisons made in the song that didn't use like or as. Having the similes already displayed on the anchor chart let them make the visual connection between the comparisons. They knew not to look for the "like or as" phrases, and to focus on the others. We regrouped and each team wrote a metaphor they had found on the anchor chart. It was funny to watch them look up some of the words they didn't know, and phrases they couldn't visualize. For "you have termites in your smile" I had one student look up termites and one look up smile, then imagine what would happen if we put those two together. There are so many great descriptions in the song; I was able to check if my students were understanding sensory words like slimy, moldy, sweetness, and imagery like seasick crocodile. As an exit slip, I had them choose whether they would rather have a brain full of spiders or be a rotten banana. They told their partner which and why (amid much giggling) and then shared with the class. The next day we reviewed the difference between simile and metaphor, referencing our anchor chart. I then showed them this link, which teaches you how to draw the Grinch (and other characters! it's so cool!). We watched it together, then I showed them my example. 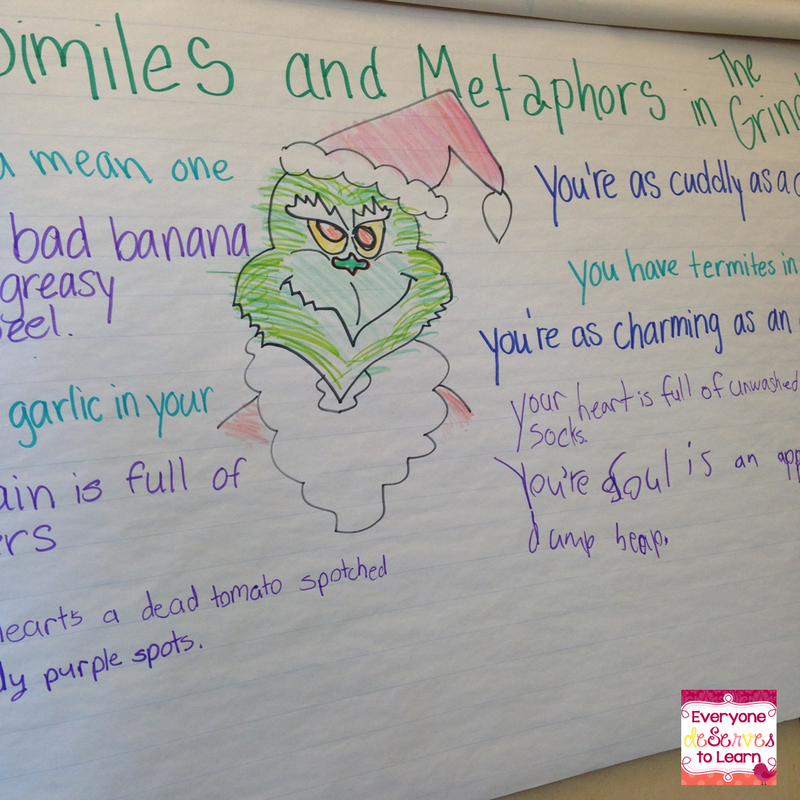 Their mission was to draw the Grinch from the tutorial with any metaphor or simile from the anchor chart we made. I was tempted to have them draw the Grinch AS a cactus, or AS a bad banana, but decided it would be better to have them use the tutorial. They came out so great! After we put our drawings on the door (did I tell you they took away my bulletin board? Story for another time) we did a "gallery walk" and each student shared his drawing and told whether it was a simile or a metaphor. They loved this lesson, and their learning was evident when sharing their drawings. I'll give them a formal "written" assessment later when we do personification, but this was just the thing to hammer those concepts home. Thanks, Mr. Grinch! Beep Beep! The sound of Moby is a very familiar one in my classroom. For some reason, any topic taught by Tim and Moby or Annie and Moby is absorbed 57 times better than if taught by me. I've learned to let it go and just play the BrainPoP. 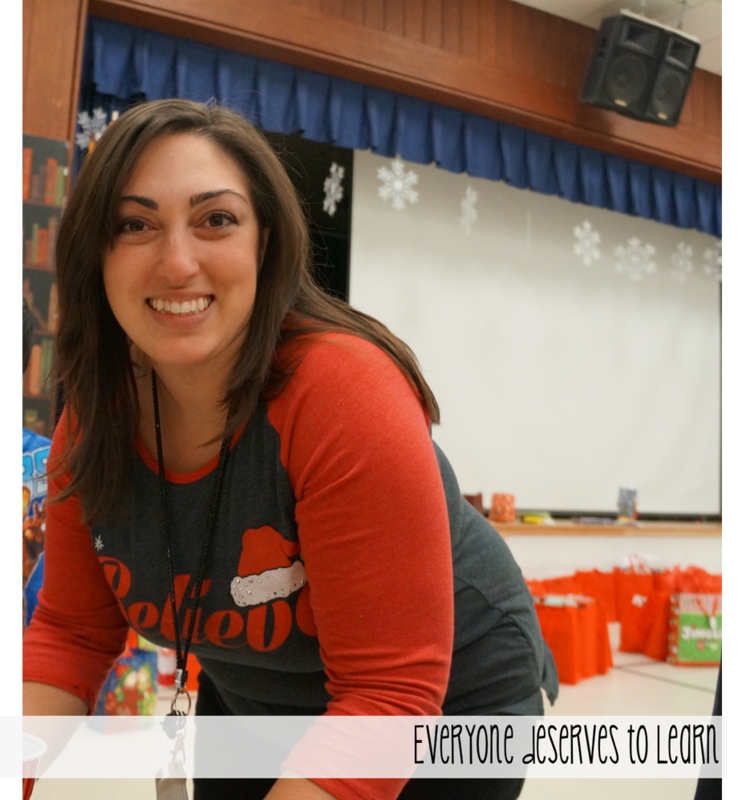 I'm here today to share all the new ways to use BrainPOP in your classroom. For those of you with a home/school subscription, you're in luck! For those of you without a subscription, a free trial is a necessity. If you want to see the whole presentation, click here! My classroom is paperless; the only paper we use is when we make crafts for our bulletin boards or Post-its for our easel. This sounds pretty extreme, right? In order to make it work, I have to get creative when it comes to formative and summative assessments. BrainPoP has helped me out with that! Click here for the full presentation. You can log into BrainPOP with a standard school username and password and access all of the videos, quizzes, brainstorming webs and games that I'll explain below. BrainPOP has created a platform where teachers can create classes- in order to do that you need an educator code. See if you can get one from your administrator! Bat your eyes, bring in coffee for the staff, wash her car, babysit the kids*...do whatever it takes to squeeze this out of the budget- it is completely worth it. *Note: bribery is not endorsed by Everyone deServes to Learn. Bribe, cajole, and wheedle at your own risk. Click here for the full presentation. One you've gotten a school code, and set up your teacher account, you can create classes. You can create one for each class, or create one big class for your whole day. 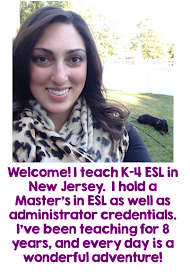 I teach multiple grades, so I would create a class for each period. Now, let's say you have a 4th period Math class, in which two students are also from your 1st period English class. Don't worry! I'll show you how to do that in a little bit. The image above is important. You're going to be creating a class code,which your students will use to become part of your class. Keep reading to find out how to create a student account, or click here for the full presentation. Students need to create an account (the presentation details it step by step), and then will use the class code to log into your class. You'll be able to see, modify, and access all the students in your class. This is the screen a student will see when she logs in. At the top, you will continue to see Enter Code. They can use that to join another class or take a quiz that you've created. Keep reading to find out how to make a quiz, or click here for the full presentation! We can use our class account to create pre-tests, post-tests, formative assessments, summative assessments, and any other assessment you'd like to administer! My general process is to view the video in partners or as a whole group, then have students take the original BrainPOP quiz. Once I see their results, I can tell if I need to delve in deeper. I would then have them Make a Map (keep reading) or assign a new quiz. Here's a little tip if you watch the videos whole group: use Moby's "beep beep" to have the students make an inference about what he is saying. I equate it to the "waa waaa waa" from Charlie Brown. Students need those inferential listening skills to help them better understand. Let's say I'm teaching a Judy Blume author study next week. I would type in Judy Blume, and about 50 quizzes will pop up. One or two are from the BrainPOP geniuses, but the rest are from teachers just like you who have already created a quiz. Now, you have the opportunity to mix and match from any of their previously created quizzes, or write your own questions. Even if you choose a question from a previous quiz, you can still edit it to suit your kids' needs. What if you want to differentiate even further? Make two (or three) quizzes! Each quiz comes with its unique code to give to students. When they log in to BP, they will then enter the quiz code, take their unique quiz, and submit right to you. Easy peasy, and no copies! So now that my students have taken their Paleolithic Era quiz (BrainPOP has movies and quizzes for every topic you can imagine! Except suffixes in BrainPOP Jr. I'm still waiting for that one!) they can submit, print, email, or view their results. I have my students submit right to me. You can print your results to a printer or to a PDF, which makes grading super easy. Here I can view which students too which quizzes, as well as a snapshot of their grade. I can go into each student's account to see how they did. I can also click on the quiz to see how my whole class did on each question. Let's check in: so far we've covered: making a teacher account, making a student account, creating quizzes, and viewing student work. That's a lot! Are you tired yet? I did a 2 hour presentation on BrainPOP and still didn't cover everything, so feel free to take a break if you need to! The next few slides are about Making a Map, which is kind of like a thinking web, and playing games, which we all know is the best part. Here's Make a Map: For any topic in BrainPOP, not BrainPOP Jr. *yet* we can have our students create a thinking web. The video is there, as well as keywords and often images that can help their thinking. Students can screenshot parts of the video and talk about a keyword from that section. They can save their work and go back to it, or submit to their teacher. In my building we use One Note as student notebooks, so I can have them print it there as well. Last but not least is GameUp, which you can find in BrainPOP and BrainPOP, Jr. You can use a game as a pre-assessment or post-assessment. I often have my students work in pairs to play. If a student has logged into your class, you will be able to see all the games he/she has completed. Here were some questions from my presentation- I hope they can spur some discussion in the comments! Leave a note or email me if you have questions about setting up or managing your BrainPOP accounts! Beep Beep!